On December 4, 1997, a little coffeehouse with a green siren logo opened its doors at 6750 Ayala in Makati. Since then, the brand has popped up in every conceivable part of the country and has become so ingrained in the Filipino way of life that it has become every barkada's preferred tambayan, meeting and presentation spot for professionals, date and meet-up place, and even study hub for students. To celebrate this milestone, Starbucks releases elaborately designed anniversary mugs/tumblers that feature 200 white and emerald Swarovski® crystals set in traditional textile patterns, special-edition numbered certificate and ready-to-gift boxes stamped with the Starbucks wordmark. 500 pieces of this collection are made in full white gold priced at P6,295. 1500 pieces of the same design come in silver and white double-wall ceramic versions priced at P4,295. Meanwhile, an acrylic version sporting the same design costs P895. If you are looking for the perfect holiday gift for someone real special, the gold design just screams - BUY ME! You will get that chance on December 1 when the limited-edition items will be exclusively available from 2PM to 8PM at Starbucks 6750 on Ayala Avenue. 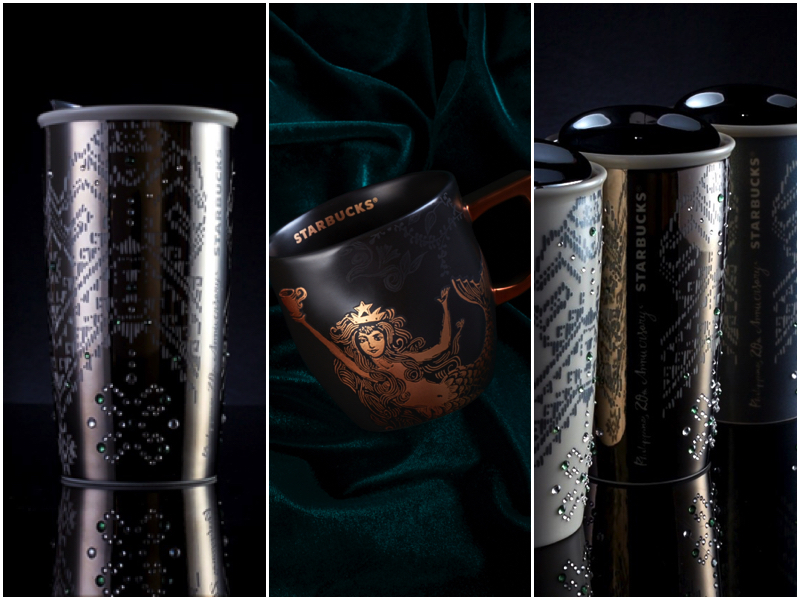 Not to be missed is is the Starbucks 6750 Ayala Mug with matte black ceramic mugs designed with the gold Siren design. This tribute item for the landmark store features special hand-painted finishes and comes in an elaborate gift package. The 6750 branch will exclusively carry the item priced at P1,295.